I am so upset. 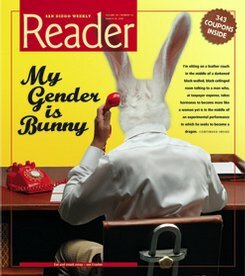 The reporter from the San Diego Reader, Ernie Grimm, contacted me a few weeks ago to ask if I would do a television interview with him when the story came out on the cover of the reader. I accepted and the reader’s publicist contacted me about TV interview dates. They scheduled an interview with me for this morning with an 8:50am arrival time for a 9:20am live air interview. I arrive on time, conservatively dressed with a long skirt, tights and a scarf up to my neck. We chat cordially in the break room first and then move to the green room. The publicist goes to talk to the anchor, and returns at 9:18AM to say “Micha I have some uncomfortable news. I’m so sorry, but because of how you’re dressed, they can’t have you on the show.” She goes on to tell me how they want to cover the Second Life aspect of the story and not talk about transgender issues at all.